2017 was one for the books here at Common Ground Public Relations. While the year brought many challenges, it also brought a lot of growth and memories for our boutique agency. While the CGPR ladies were hard at work writing, editing, pitching and executing events, Lynese managed the finances, HR and technology for the growing team and client roster. In January, Pia, Kelsey and Denise helped launch Karuna Beverages in the St. Louis market. These plant-based beverages can be found in grocery stores city-wide. 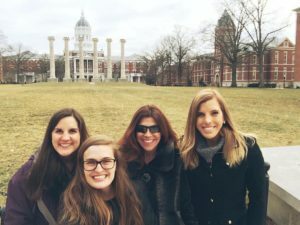 Jenna, Kelsey, Maggie and Lynese journeyed to Mizzou (go Tigers!) for the Strategic Communication Career Fair where they met talented journalism students from across the country to chat about internships, careers and life as PR pro. Maggie grew her professional skills in Denver at a Ragan writing and editing workshop in early February, and the rest of us reaped the benefits back home thanks to her detailed, color-coded notes. Travel season picked up for CGPR in March – Denise and Maggie took to the Big Apple to assist the Thick-It client team in executing an educational presentation on dysphagia treatment and modified diets to NYC-based speech-language pathologists; and Jenna packed her bags and joined Huffington Post reporter Hugh McIntyre in Mexico for a visit to El Mayor’s distillery, Destiladora González y González, and its agave fields. 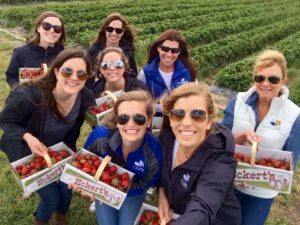 May kept us on our toes: We celebrated strawberry season with a CGPR outing to Eckert’s Farm, and Jenna and Lynese represented CGPR at the EY Entrepreneur of the Year Awards Gala in KCMO. CGPR ladies organized the inaugural United States Bartenders’ Guild “Make It Exotico” cocktail competition and traveled to seven cities in four months to execute each semifinal event as well as the final competition at “Tales of the Cocktail” in New Orleans. Over the summer, the CGPR team spent more than 36 hours on-site at Fair Saint Louis in Forest Park and coordinated traditional and digital media coverage – all-in-all earning over 242 million media and 22 million social media impressions for the Fair. We all took a quick breather following Independence Day – Pia visited her family in Miami, Kelsey spent time frolicking through Italian vineyards in Tuscany, Denise sent her firstborn off to college at Colorado State University, and Maggie got engaged in Mexico! We celebrated the 14th anniversary of CGPR and the August solar eclipse poolside and with cocktails in-hand. Come September, we flexed our festival muscles once again as we coordinated all things media for the eighth annual LouFest – which transitioned to a new location within Forest Park, added a Friday night event for college students (LouFestU), and welcomed a record 60,000 festival-goers throughout the weekend. Our team even met Bryan Greenberg on-set! 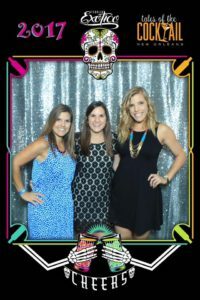 Just two weeks after LouFest – Jenna, Kelsey and Denise jumped aboard the Faye Fest train and led media relations efforts in celebration of Deli Star Corporation’s 30th anniversary. 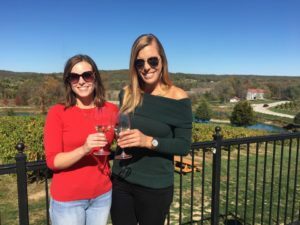 Jenna and Stephanie, Mizzou journalism buddies turned CGPR office-mates, celebrated their 30th birthdays at the end of October with a CGPR outing to Chandler Hill Vineyards. 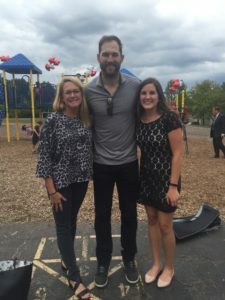 St. Louis Cardinals starting pitcher Michael Wacha earned a lot of smiles from students at Carman Hills Elementary School when he cut the ribbon on the school’s new playground, made possible through a $20,000 grant by UnitedHealthcare to Dreambuilders. In addition to snagging a pic with Wacha, Denise and Maggie secured media coverage from several local TV, radio, print and online media outlets on behalf of UnitedHealthcare. This fall, Nina was appointed as the new PRSA St. Louis APR Chair and will be mentoring those wishing to become accredited in public relations such as Jenna, who began the APR certification process earlier this year. Joining Nina on the 2018 PRSA St. Louis Board of Directors and stepping in as Chief Ethics Officer is CGPR’s very own Maggie, who was voted in during October elections. November and December flew by with Bethesda’s annual Legacy Luncheon, new client meetings, another edition of the Logan Tower, Thanksgiving, Winterfest at the Arch, and the CGPR holiday party at Music Record Shop. It was truly a wonderful year – cheers to 2018, and CGPR’s 15th anniversary!